U.S. citizens and residents have to file Form 5471 if they are shareholders in a foreign corporation. In addition, many categories of income would be categorized as a subpart F income and taxed currently. The Tax Cuts and Jobs Act has expanded that with the GILTI category. As a result, it increased the numbers of the Forms 5471 Americans need to submit. It also created an obligation where none existed in the past. It is an onerous form, similar to a corporate tax return. You will need to report the income and expense sheet for the current year of operation. As well as the balance sheet for the corporation. You also should include transactions between you and the foreign corporation, original capital contributions and other required information. 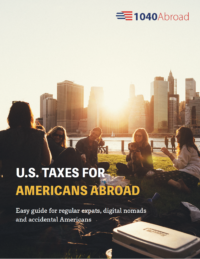 Contact us if you want to receive free tax guide for Americans living abroad. Do you know that Form 5471 is informational return and not a tax return? That means the IRS uses it to track and have complete data of US persons who own foreign corporations. However, you do not pay tax on it to the US government. Well, unless you failed to file form or submitted the incorrect return and thus will be facing penalties. The IRS doesn’t want anyone to hide their assets. Are you a US person who lives in the US, owns a foreign corporation and cares about asset protection? Owning a business in a foreign country gives you many opportunities. You can use foreign tax credits and tax treaties to offset your US tax based on foreign tax paid. We covered all the changes and solutions for American business owners who got affected by The Tax Cuts and Jobs Act. Several categories need to report their ownership. For example, US persons with an acquisition of a minimum of 10% of the stock of a foreign corporation. Tax Tip 1: You will also need to report information regarding trusts and foundations by filing additional forms. It’s in place to have maximum transparency of US person’s foreign business activities. Filing any IRS informational forms shouldn’t scare you. We know that the paperwork is demanding and can be quite complicated. But we also know the perspectives of the IRS catching you and charging penalties is even worse. Besides fines for not filing form 5471, there are penalties for late filing. So additional penalties may apply to each Form 5471 which is filed after the due date of the income tax return. Are you confused if you need to report your foreign business to the IRS on this form? Don’t worry, we’ve got you covered. Let’s go through Form 5471 requirements and deadlines, which determine your filing obligations. First, let’s clarify what a foreign corporation is. It’s a legal entity which was established under the laws of a foreign country, different from the United States. Almost any non-US entity, which has owners with limited liability will be classified as a corporation by US tax rules. You are a shareholder of 10% or more in a foreign business, that is Controlled Foreign Corporation for an uninterrupted minimum period of 30 days in a year and you own those shares on the last day of the year. Tax Tip 2: If you have a subsidiary or personal company that you own or you have a US company, which owns the foreign corporation, then you will need to file Form 5471. Regardless of where you live, requirements apply to any US person/company. Even Google that has subsidiaries in other countries have to file the forms. Tax Tip 3: There is no way you can escape filing this form unless you decide to renounce your US citizenship. As long as you have a foreign business/corporation, then you will need to file. Having US citizenship comes together with a tax burden. Yet you are the one to decide what is more important for you. Tax Tip 4: You can change the classification of your non-US corporation to a partnership or disregarded entity. In this case, you will no longer report it on Form 5471. But you will need to file other IRS forms, such as Form 8865 or Form 8858. The IRS knows that some folks try to avoid reporting their foreign businesses. Usually they do it by passing the ownership to a third non-US person. However, there is such a thing as “The Ultimate Beneficial Owner”. It means if it’s your company and you are the ultimate beneficial owner, then you have to report it. And persons who think they can avoid filing requirement once they pass their ownership are pretty much mistaken. Let’s talk more about who needs to file Form 5471. If you happen to fit requirements for two or more filing categories, then you will need to include the information required for them all. Category 1 Filer: It’s a filing group of US shareholders of specified foreign corporations (SFCs). It includes controlled foreign corporations (CFC) and any foreign corporation that has one or more domestic corporate shareholders. An important caveat to this decision is the fact that IRC section 965(e)(2) expands CFC to include 10–50 corporations. If the foreign entity is also a passive foreign investment company (PFIC) and not a CFC under the traditional definition, it is excepted from the application of IRC section 965. Category 2 Filer: US person has acquired 10% or more of the stock in a foreign corporation as an officer or director. It’s not only about the total value of the foreign corporation’s stock. If you acquired 10% or more of the total combined voting power of all classes of stock with voting rights, then you fit in this category as well. This group of filers only need to report the minimal amount of information about the corporation and the US person, who has acquired it. Category 3 Filer: This one includes US persons who add to their stock in a company and it leads to surpassing the 10% minimum ownership. Also, any US person who disposes their stock in a foreign corporation and they now own less than 10%. Those who match these criteria must report a large amount of information. You will need to submit an income statement and opening and closing balance sheet. On top of it all, you will need to disclose the identity of other US shareholders. US persons for Category 2 and Category 3 Filers can be citizens or residents of US, a domestic partnership, a domestic corporation and an estate or trust that is not a foreign estate or trust as defined in section 7701(a)(31). While for the next category 4 filer, US person also includes two more types. First, a nonresident client who elected to be treated as a resident of the United States. Second, an individual for whom an election is in effect under section 6013(h), relating to nonresident aliens who become residents of the United States during the tax year and are married at the close of the tax year to a citizen or resident of the United States. Category 4 Filer: This category includes a U.S. person who had control of a foreign corporation during the annual accounting period of the foreign corporation. By control, IRS means a US person who has control of a foreign company at any time during that individual’s tax year and it owns more than 50% stock. Again, it includes more than 50% of the total combined voting power of all classes of stocks or more than 50% of the total value of shares of stock. If you are in control of a corporation that owns more than 50% of either criterion, the IRS treats you as being in control of such corporation and expect you to file Form 5471. For example: Corporation A owns 51% of the stock in Corporation B. Corporation B owns 51% of the stock in Corporation C. Corporation C owns 51% of the voting stock in Corporation D. Therefore, Corporation A controls Corporation D. Those who fall under Category 4 filer have to submit everything that Category 3 Filers report as well as information about the corporation’s undistributed earnings and reportable transactions. Category 5 Filer: US persons who own at least 10% of a “controlled foreign corporation aka CFC”. Applies to US person, who owns (directly, indirectly, or constructively) stock/voting power in a foreign corporation that is a CFC at any time during any tax year of the foreign corporation, and who owned that stock on the last day in that year on which it was a CFC. You will need to provide identifying information about the CFC and undistributed earnings. A lot of people ask about Schedule J, which you might need to file together with Form 1040. You report the accumulated earning of a CFC on this form. US persons, who are a director, officer, or major shareholder will need to file it. You will use the functional currency of the corporations on this form. Refer to the table below to determine which schedules you need to file based on your category filer. *There may be additional filing requirements, please, consult tax professional to determine your filing obligations. As you can guess, hefty penalties apply for not filing Form 5471 or filing it incorrectly. The $10,000 USD penalty applies for every tax year you fail to report needed information. Other than that, there is another $10,000 USD penalty. It is charged when an individual hasn’t provided required info within 90 days after the IRS has mailed a notice to US person. On top of that, the iRS will charge an additional amount of $10,000 USD every 30 days until the taxpayer files the form. For each failure, there is a maximum penalty of $50,000 USD. Your corporation doesn’t necessarily need to have profits for penalties to apply. Why? As we mentioned earlier, Form 5471 is an informational return thus you don’t pay tax on it but only have to report the required information. If you haven’t been compliant and need to report Form 5471, then we strongly recommend consulting a tax professional to help you in this situation. Filing this form incorrectly also leads to penalties! You must be overwhelmed by complicated nuances of Form 5471 and we agree that it’s not an easy form to file. However, there are a few tips to make it easier for you to understand the process better. To determune schedules you need to file, you first have to know which category of filer you belong to. If you fall under two or more categories, you will select all that apply and attach all needed schedules and forms. There are cases when one person may file Form 5471 and the applicable schedules for other persons who have the same filing requirements. Do you and one or more other persons need to furnish information for the same foreign corporation for the same period? You can file a joint information return that contains the required information with your tax return or with the tax return of any one of the other persons. Anyone who meets the definition of US shareholder must be included when you file your return and attach schedule B. It’s one of the ways how the IRS knows if you are a US shareholder of foreign entity even if you do not file Form 5471 yourself (and risk to face heavy penalties!). Remember that you might need to file Form 8938 if you reached the reporting threshold. If you file Form 5471, then make sure you disclose the number of forms filed on the face of Form 8938. You report it under Excepted Specified Foreign Financial Assets. Discoed your ownership of foreign corporation as an Other Foreign Financial Asset if you don’t have a filing requirement for Form 5471, but do have ownership of foreign corporations and meet the reporting threshold for Form 8938. Don’t let Form 5471 leave you anxious and worried. 1040 Abroad has excellent US international tax experts, who will guide you through the entire process. We will help you with filing Form 5471. Our happy customers share their experience of working with us on Trustpilot and you can check the reviews here. Contact us now if you want our help this tax season!